Many SaaS companies encounter one common challenge: they have a good product, but people are not buying it. The reasons can vary from a bad marketing strategy to a meager budget, a low-quality product, a variety of SaaS pricing models or a number of other causes. However, a bad pricing policy can be one of the biggest problems. The wrong pricing model can discourage any potential customer from making a purchase even if you have a good product and excellent marketing. In contrast, the right pricing policy can provide you with a steady influx of customers along with growing profit. There is no specific answer to the question “Which pricing model is the best”. Many factors influence your pricing model, including budget, the size of the company, quality of the product, the number of features you offer and many others. 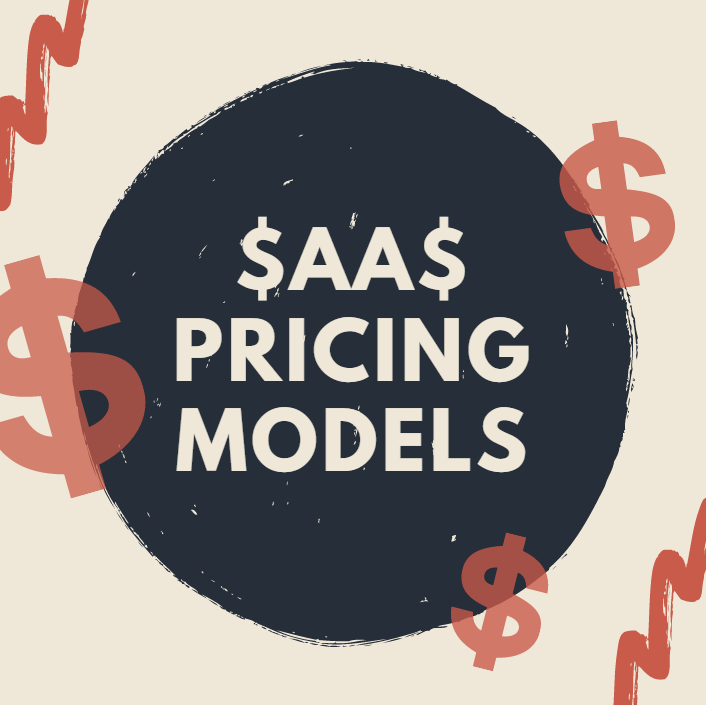 In this article, we describe the main SaaS pricing models and give you useful tips to consider before choosing the model that suits your product. 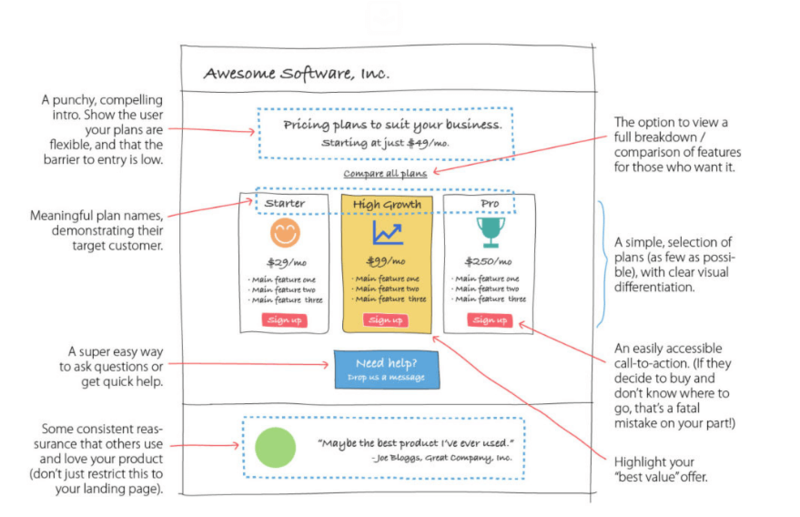 There are plenty of SaaS Pricing Models. 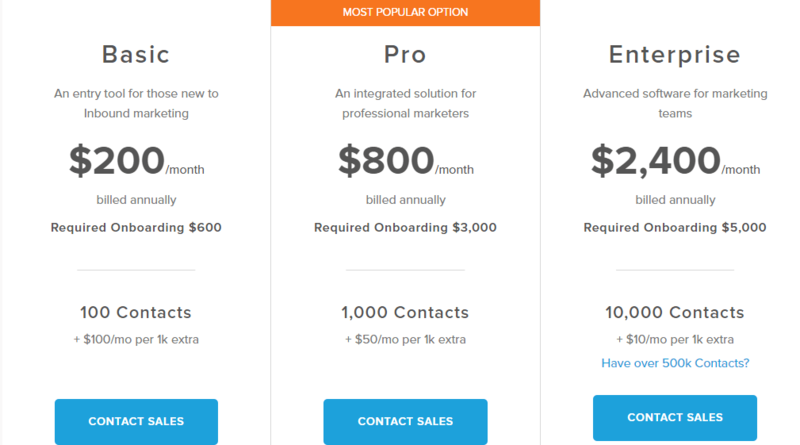 This vast collection of B2B pricing pages confirms it. Let’s consider the examples of existing pricing models in successful companies. They are chosen by value metrics, points according to which a price is set and customers are charged for a product. This model is a very simple and commonly used team collaboration tool. Payments depend on the number of active users. The more users, the higher the price. 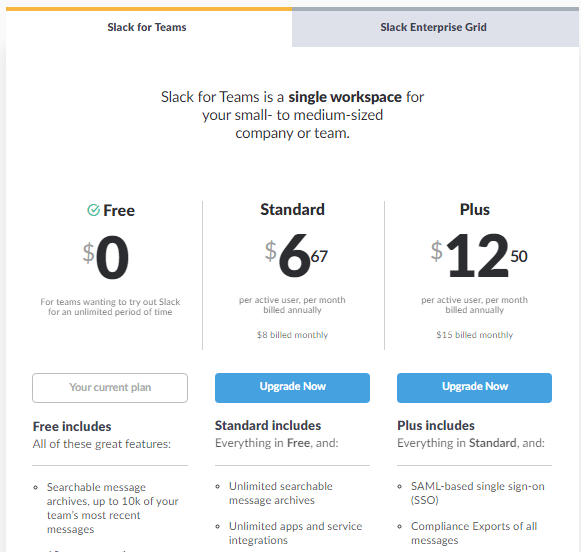 Slack, for example, offers a set price per active user. It has different options: Free, Standard or Plus plan which varies depending on features. Some team members may need both basic and premium features while others will be satisfied with a free plan. Patrick Campbell, co-founder and CEO at Price Intelligently considers that the Per User Pricing model can kill your company’s growth, especially if you offer a product to multiple customers. You limit yourself to a number of active users and people who can test your product in its full functionality. In this model, users pay for the amount of storage they use. For example, Dropbox gives you 500MB of cloud storage space for free, and then you pay only if you need more. This model allows people to try out a service and encourages them to upgrade it when they hit the limit. There are some models in which users pay for the number of features, upgrades and additional services they want to use. Salesforce has such a pricing model. 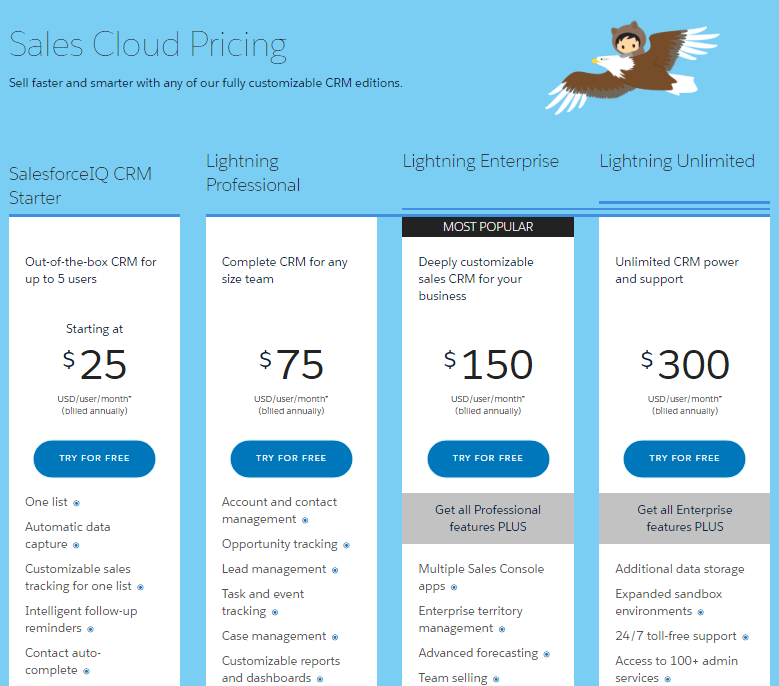 As you can see, Sales Cloud Pricing has four options with several features listed below. The word Freemium combines free and premium. This implies that you provide your core product for free and offer a few additional “premium” features for money. LinkedIn uses such a model. It also offers free trials for all the extra features. This model works well if you offer a valuable product with premium features that are worth buying. However, there is a danger that people may not want to upgrade and will continue to use only the free version. Hubstaff, for example, describes this problem. This kind of pricing takes place when the number of permitted users increase in bands rather than single digits. For example, a company may pay for only 5 users, or they may pay for up to 100 users. This model is frequently used for marketing and sales where there are databases with a large quantity of contacts. For example, Hubspot offers three plans according to the number of contacts you have. Appfolio has almost the same principle. This property management software provides different opportunities for business development with its pay per unit model. In this case, the units are properties, rooms or houses. This model implies that customers pay only for the resources they consume, similar to the way you pay for utilities such as water or electricity. Once you stop using, you stop paying. Amazon Web Service uses such a principle. It offers cloud storage, databases, computing systems, mobile services, and management tools along with other services. This model enables you to provide the main product for free while making money on advertising. It works great only for popular platforms and web services. Facebook is a very popular platform not only for communication but also for advertising, leading businesses, and so forth. Facebook’s annual revenue in 2016 was around $30 billion. Facebook generates a profit with the help of advertising and selling add-ons in games, gifts and virtual goods. The popular renting platform Airbnb uses this system. A broker, who wants to rent out lodgings or spaces pays a fee for placing an offer on this platform. Simultaneously, the service is free for tenants. As you can see, a pricing model depends, at least, on the kind of product and features you provide. Here are some points to consider before choosing a pricing model that suits you. You should define your particular approach to pricing. There are two variants: value-based pricing and cost-based pricing. Both customers and companies consider value-based pricing trustworthy. This approach implies that the price depends on the value that your product delivers to the consumer. It is even better when your clients purchase a product with an unquestionably high value and pay less for it. You should explain to them how they benefit from this deal. The second variant – cost-based pricing – calculates expenses based on the production of your cloud solution. The problem here is that cost can be much higher than a customer estimates your product or its features to be. Most likely, the customer will refuse to buy such a product. 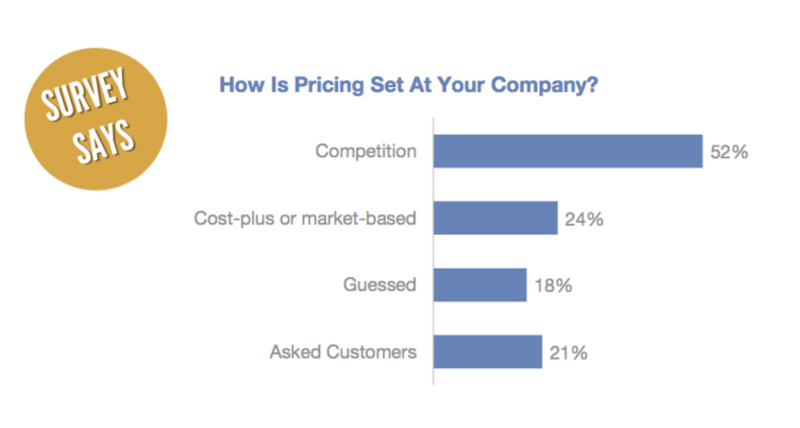 A study of the Top 270 SaaS Pricing Models showed that only 1 in 5 companies base their price on customer value. The same study shows that the majority of businesses look to their competitors’ model to set their prices and calculate costs. The fact that the majority uses this type of approach doesn’t mean that it’s correct. However, it is not to say that when you decide to base your price on the perceived customer value, you should completely set aside your costs. A customer’s lifetime value (LTV) is a metric that influences the resources you allocate to the product and shows what you can afford to spend to acquire customers. He tells that LTV is – or eventually should be – a critical factor in almost all your sales and marketing decisions. You can not set the right price without knowing how much you pay when acquiring a new customer. That’s why other essential metrics you should take into account are Cost Per Lead (CPL) and Cost Per Acquisition (CPA). CPA is the amount of money you spend to gain a new paying customer. CPL is the amount of money you spend on your marketing campaigns to generate a new lead. Finding the right target audience will help you with setting the right price. Different groups of customers may want a product with a different set of features at a different price they can afford. It’s important to determine which audience you are targeting, think about their problems and wishes, and evaluate their paying capacity. Price options will help you attract various groups of people. It is crucial to classify your features in such a way that customers from different groups could find them helpful for their goals. A good idea is to create an analysis to find out whom you should target. Then ask your potential customers which tools they are interested in and which prices they are ready to pay for. ChartMogul, an analytic platform for businesses, analyzed top B2B pricing pages and found common components of SaaS pricing pages that can guide your visitors towards signing up. Ed Shelley, Director of Content at ChartMogul, writes that these page designs have been tested for performance and each component gives the user the right information and guidance towards signing up for your product. Why not try this design on your pricing page? At the top of your pricing page should be a punch, i.e. a compelling intro, followed by an option to compare all the plans. At the center of your SaaS pricing page, the main significant portion that includes plan names and descriptions is placed. Place your best plan in the middle and highlight it. Don’t forget that all plans have their own call-to-action button. Also, there should be an option for visitors to ask questions and receive help quickly. That’s why you should place a “Need help?” block on your pricing page. At the bottom of your page, place a few testimonials from users that love and use your product. Interesting research on the “Center-Stage Effect” was conducted at the University of Chester. It shows that when facing a set of products, we tend to choose the one in the middle. 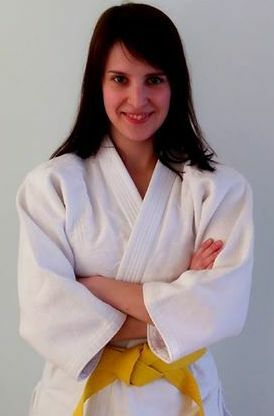 The participants were asked to choose one picture out of five placed horizontally (each was a similar version of the same item). The results showed that the participants preferred objects placed in the center instead of those that are situated on both sides. From a psychological point of view, it’s better to position your best plan in the middle. 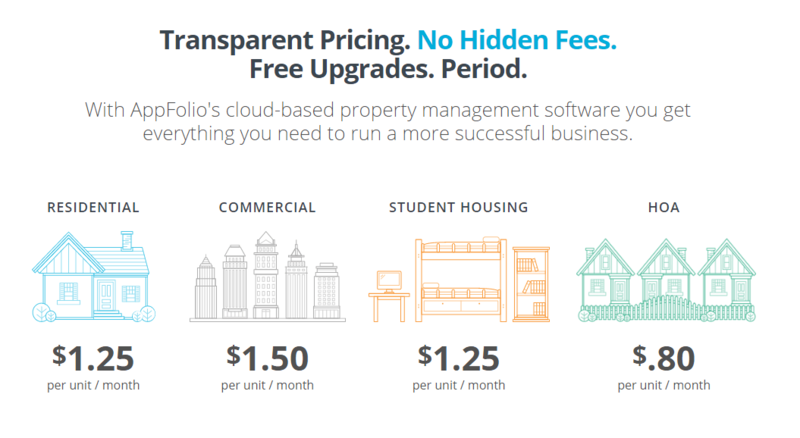 In this article, we have discussed the most common SaaS Pricing Models. They include Per User or In Usage Pricing model, Per Storage Pricing, Freemium, Per item pricing and many others. review competitor’s prices but do not to align with it. Lastly, take notice of the main pricing elements that should be on your page and place your best plan in the middle. We hope that the information provided in this article will help you to choose the best pricing plan that suits your product. Which pricing model do you have now? Do you think it meets the needs of your business?